A group of Swiss scientists have been using scattered LEDs, neural circuity, and an army of miniature robots to explore the very basis of good and evil. No, you aren't reading the back cover of a DVD in the "one dollar each, please get this trash out of our store" bin of your local blockbuster -this research is very real and very, very awesome. Dario Floreano and his team at the Laboratory of Intelligent Systems in the Swiss Federal Institute of Technology built a swarm of mobile robots, outfitted with light bulbs and photodetectors. These were set loose in a zone with illuminated "food" and "poison" zones which charged or depleted their batteries. Their programming was initially random, so the first generation staggered around the place like bunch of concussed puppies. At intervals, the robots were shut down and those that had the most charge left in their batteries were chosen as "successful", and their neural programming was combined to produce the next generation of the robots. These offspring are downloaded into the same mechanical bodies their parents inhabited, forming an closed-circuit Buddhist system which might be an extremely efficient method of maintaining a stable population, but will provide a serious headache for any robot philosophers who might turn up. Which could happen before long. 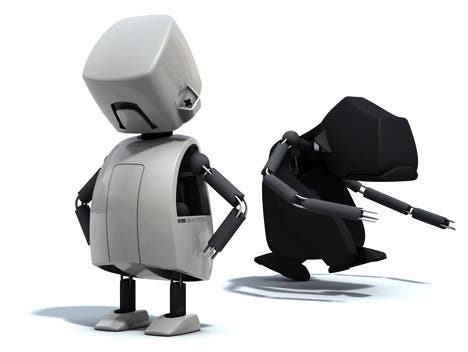 Within fifty generations of this electronic evolution, co-operative societies of robots had formed – helping each other to find food and avoid poison. Even more amazing is the emergence of cheats and martyrs. Transistorized traitors emerged which wrongly identified poison zone as food, luring their trusting brethren to their doom before scooting off to silently charge in a food zone – presumably while using a mechanical claw to twirl a silicon carving of a handlebar moustache. You might be upset by this result, scientific proof that those who say "Evil is utterly fundamental to human nature" actually understates the scope of the problem, there were also silicon souls on the side of the angels. Some robots advanced fearlessly into poison zones, flashing warning lights to keep other robots out of harms way. At this rate of evolution, how long before we start to see other behaviors? Maybe polarized priests, warning other robots not to eat any food so that they may receive infinite food after they're switched off. Or actorbots, given huge quantities of food because they can pretend to be turned off by poison really well?